Barnabrow, from the Irish, Bar na Brugha, means Gap in the Fairy Fort. Fairies, these little magical creatures decided many, many years ago, that they liked Barnabrow and moved in. We have named one of our cottages after Mor, who was the Fairy Goddess of Cloyne. She was abducted from Cashel hundreds of years ago by the Cloyne fairies because she was so beautiful. The Whitehorn tree is known as the Fairy tree, it blooms with a lovely white flower at the start of the summer and we have lots of those trees at Barnabrow. Fairies have been spotted in many of the nooks and crannies, behind the trees and even in the restaurant – we think that they sprinkle Fairy Dust to make the food taste so good. But our advice is to take a wander to our Fairy Grove, just above the donkey field. This is where they settled and made homes and regularly have parties at midnight. Did you know that Fairy music is the most beautiful music in the world and when humans hear it, they cannot stop dancing? This makes Barnabrow a very good place for weddings – the Fairies make everybody very happy. Especially on mid-summer’s night, in Barnabrow, you can hear the Fairies celebrating and dancing and singing. Sometimes the donkeys join in with lots of Hee-Hawing. Fairies are smart and very quick; they easily outwit and befuddle us when we try to find them, but we have found they are much friendlier to little boys and girls. Fairies love shiny things, particularly things no one else seems to want, like old buttons, charms and paperclips. They do not, however, like money. That is why they give it away when they collect children’s teeth from under the pillows. Some Fairies have a talent for hearing wishes. We are told it is like hearing whispers in the wind to them. They know exactly who a wish has come from once they hear it. 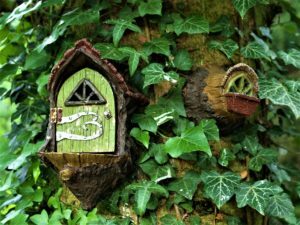 So remember on your next visit to Barnabrow, drop by our Fairy Grove, just above the Donkey field and let us know if you see any of our tiny residents and their houses.